Sorry folks, but I think things are going to be rather quiet on here until December. I am in thesis writing mode, and it has become unexpectedly stressful. I'm not going to have the luxury time I once had for quite a while. Please check in, as I will try to post comics or videos, but there will be no articles. Today I don't actually have a comic for you, just an amazing work of art I stumbled upon somewhere online. 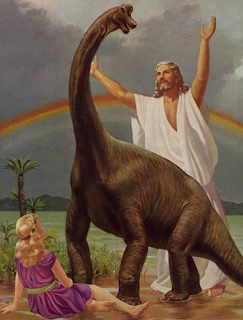 The number of 'Jesus with dinosaur' images is staggering. I'm not quite sure the point, but it is usually in the context of Young Earth Creationists arguing that humans and dinosaurs once co-existed. Since kids love dinosaurs, there are many children's books put out by such organizations with truly inspired images. Are you telling me that Jesus, Brachiosauri AND rainbows co-existed?! Unfortunately, Young Earth Creationists don't seem interested in drawing unicorns.